The quality and depth of Sunrisers Hyderabad's seam attack proved the decisive factor in a low-scoring scrap against Gujarat Lions on a two-paced pitch at the Rajiv Gandhi International Stadium. 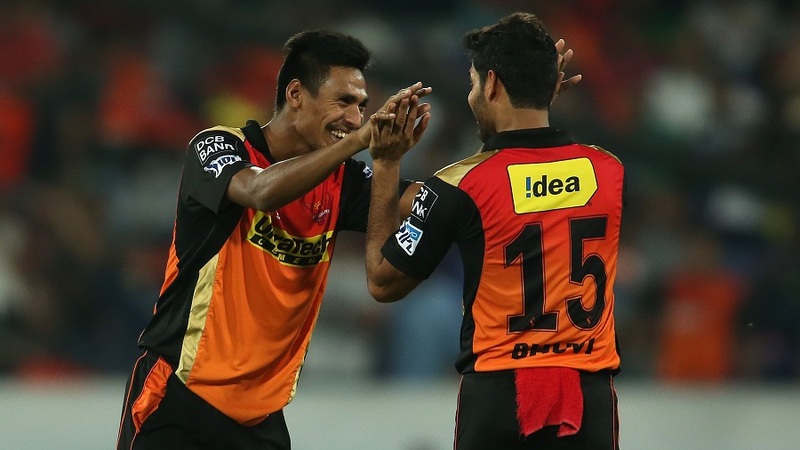 Bhuvneshwar Kumar, Ashish Nehra and Mustafizur Rahman bowled with skill and nous to restrict Lions to 126, and though Sunrisers lost wickets regularly, the smallness of their target meant their batsmen never had to over-extend themselves. Apart from having a set target to aim for, Sunrisers were helped by the conditions easing somewhat in the second innings, with a little less swing for the Lions new-ball bowlers. David Warner gave the chase early momentum, hitting two sixes off Pradeep Sangwan in the second over. On a slow pitch, Sangwan provided pace onto the bat, and also bowled the wrong lengths; when he came back in the 13th over, he began with a short ball outside off and a half-volley on the pads, and Dhawan put both away for four.